Tin-based opacification by tin oxide and lead-tin-oxide particles was used in glass production since the first millennium BC and in ceramic glazes since the eighth century AD. Opacification process is often characterised by significant amounts of tin oxide and lead oxide dispersed into glassy matrices or by identification of the opacifying particles by means of microstructural or (micro-)XRD analyses. The processes of opacification and manufacture are usually more difficult to establish from compositional and microstructural analyses because they leave little diagnostic traces. 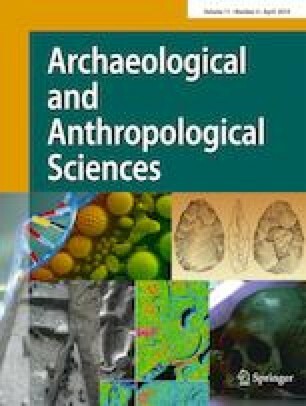 This review aims to integrate compositional data on archaeological glass and glazes and in particular the Pb/Sn values, with descriptions of the opacification processes in historical treatises, observations at traditional workshops, and the results of previous replication experiments to shed further light on technological issues underlying these methods of opacification and highlight new research perspectives. The online version of this article ( https://doi.org/10.1007/s12520-018-0735-2) contains supplementary material, which is available to authorized users. Tin-based opacifiers and colourants, namely lead-tin-oxide and tin oxide, were used to produce, respectively, yellow and white glass and glazes. They were also used as opacifiers in glass and glazes coloured by other metallic oxides, such as oxides of copper, manganese, and cobalt. In ceramic glazes, the technique marked a turning point in the development of West Asian and European ceramics (e.g. Caiger-Smith 1973). The opacified glazes applied over the entire surface disguised the ceramics bodies and provided a smooth background onto which decorations could be applied. The use of tin-based opacifiers was preceded by that of antimony-based opacifiers (i.e. lead-antimony-oxide yellow and calcium-antimony-oxide white), which were first used in Egypt and the Near East in the production of opaque glasses in the mid second millennium BC and then continued in use until about the fourth century AD (Turner and Rooksby 1961, 3–5). For a short period during the first to second centuries BC, lead-tin-oxide yellow glass was produced in northwestern Europe (Werner and Bimson 1967; Henderson and Warren 1983), while evidence of tin oxide white glass in this period is rare. Lead-tin-oxide yellow glass resumed production from the first to third centuries AD in Britain (Henderson and Warren 1983; Biek and Kay 1982; Rooksby 1962) and from about the fourth century AD in western Europe (e.g. Aquileia, Italy, Maltoni and Silvestri 2018; Bayley 1981). During the Late Antique period (fifth to seventh centuries AD), lead-tin-oxide yellow glass was produced and used as a dominant type of glass at Wijnaldum (Henderson 1999) and Maastricht (Sablerrolles et al. 1997) in the Netherlands, at Eriswell (Peake and Freestone 2014) and Apple Down Cemetery (Henderson 1990) in England, at Dunmisk Fort in Ireland (Henderson 1988), at Tarbat Ness in Scotland (Peake and Freestone 2014), and at Naples (Schibille et al. 2018a), Ravenna (Vandini et al. 2014), Padua (Silvestri et al. 2014), and Milan (Neri et al. 2013, 3–4) in Italy. Concurrently, tin oxide was used in glass but appears to have been far less popular than lead-tin-oxide glass and was initially used as an opacifier in glasses coloured by other colourants. Among the earliest published examples are the purple-brown tesserae from a Roman tower at Centcelles, near Tarragona, Spain, dated to 330–350 AD, which was opacified by tin oxide particles and coloured by oxides of chromium, iron, and manganese (Turner and Rooksby 1961, 3; Rooksby 1962). 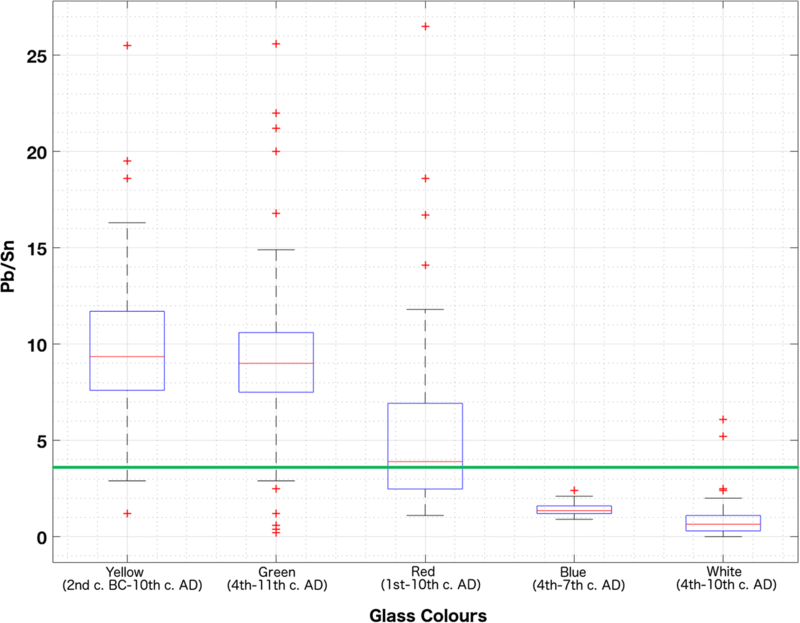 Tin oxide opacification continued through early medieval Europe in white glasses, including in England (Bayley and Wilthew 1986; Henderson 1990; Bayley 2000), Ireland (Henderson 1988), the Netherlands (Sablerrolles et al. 1997), and Italy (Uboldi and Verità 2003; Arletti et al. 2011a, b; Neri et al. 2013, 3–4), and in blue glasses in Denmark (Henderson and Warren 1983). In the Eastern Mediterranean and the Levant, lead-tin-oxide opaque glass was used from the fourth century in yellow glasses, as well as in green glasses coloured by copper oxide (CuO), and in red glasses coloured by cuprite (Cu2O). Examples of such glasses were found in opus sectile panels in Greece (Brill and Whitehouse 1988; Brill 1999, sections VH, VI, VJ), at Shikmona in Israel (fifth c., Freestone et al. 1990), at Kilise Tepe (fifth to sixth c., Neri et al. 2017), Hagios Polyeuktos (sixth c., Schibille and McKenzie 2014), and Sagalasses in Turkey (sixth c., Schibille et al. 2012), at Petra in Jordan (fifth to seventh c., Marii 2013), and in Cyprus (fifth to seventh c., Bonnerot et al. 2016). During the early Islamic period, the use of lead-tin-oxide glass continued as attested in a set of glass tesserae found at Khirbet al-Mafjar in Jericho, Palestine (eighth c., Fiorentino et al. 2017, 2018), and Qusayr’ Amra, Jordan (eighth c., Verità et al. 2017), as well as eastwards in Samarra (ninth c., Schibille et al. 2018b; M. Wypyski 2015, pers. comm.) and Ctesiphon, Iraq (9th c., Schibille et al. 2018b), Amorium, Turkey (ninth c., Wypyski 2005), and Nishapur, Iran (eighth to tenth c., Pilosi et al. 2012; Wypyski 2015). Tin oxide seems to have been more popular as an opacifier for blue and red glasses during the Late Antique in Israel (Freestone et al. 1990), Cyprus (Bonnerot et al. 2016) and Turkey (Schibille and McKenzie 2014, Wypyski 2005). It was only later in the Islamic period during the ninth to tenth centuries in Iraq and Iran that tin oxide was more commonly used as white colourant in glass (Schibille et al. 2018b, M. Wypyski 2015, pers. comm.). The use of lead-tin-oxide and tin oxide opacifiers in ceramic glazes began in Egypt and the Levant about the eighth century during the early Islamic period (Matin et al. 2018; Tite et al. 2015). The earliest examples are ceramics painted with lead-tin-oxide yellow glaze in discrete bands, found in several Umayyad-period sites, such as Fustat (Scanlon 1998; Gayraud 2009), Abu Mina (Engeman 1990), and Tod (Joel 1992) in Egypt; Aqaba (Whitcomb 1989, 1991, 48–56) and Pella (Walmsley 1995, 664 and; 667; Walmsley 1997, 2–3) in Jordan; and Tiberias (Stacey 1995,164–166, 286), Yoqne’am (Avissar 1996), and Caesarea (Arnon 2008, 35 and 400) in Israel. This technique was later developed to cover the overall surface of ceramics by lead-tin-oxide yellow or tin oxide white glazes, examples being excavated in Tell Aswad (Watson 1999), Al-Mina (Vorderstrasse 2005, 75–78), and Qinnasrin (Whitcomb 1999, 81–83) in Syria and Antioch (Waage 1948) and Tarsus (Bagci 2016) in Turkey. From around the ninth century, lead-tin oxide yellow and tin oxide white glazes were used in Abbasid Mesopotamia, with the latter gaining more popularity due to its resemblance to the white surface of Chinese Tang stoneware and porcelain (Wood et al. 2007; Mason and Tite 1997; Molina et al. 2014; Matin et al. 2018). Subsequently, tin oxide white glazes spread throughout the Islamic world and became the mainstream glazing technique used on medieval Islamic pottery, including lustre wares from Iran, Syria, Egypt, and Spain (Mason and Tite 1997; Pradell et al. 2008), Mina’i wares from Iran (Mason et al. 2001), and Iznik wares from Turkey (Henderson 1989; Tite 1989; Paynter et al. 2004; Okyar 2002; Tite et al. 2016). In Spain and Italy, tin oxide white glazes gave rise to the production of maiolica wares from thirteenth to seventeenth century AD (Molera et al. 2001; Tite 2009) and continued in the Netherlands, Germany, Eastern Europe, and Britain (Caiger-Smith 1973, 127–140; Fourest 1980). Lead-tin-oxide yellow glazes, on the other hand, seem to have spread more strongly eastwards to Northern and Eastern Iran and Central Asia during the tenth to thirteenth centuries AD, where examples of tin oxide white glazes are scant, but still existing (Matin et al. 2018, Appendix). Finally, lead-tin oxide yellow glazes were used in tile decorations from around the sixteenth century to nineteenth century in India (Gill et al. 2014) and for, so-called, haft-rang (seven-colour) tiles in Iran (Isfahani 1888; Holakooei et al. 2014; Matin and Nemati forthcoming). The increasing amount of data published over the recent years on lead-tin-oxide and tin oxide glasses and glazes has provided an opportunity to understand and identify different trends of production. The lack of information on the methods and mechanisms associated with the production of these glasses and glazes has been largely filled with recently published replication experiments, supported by historical texts. The aim of this review is to integrate published analytical data on glasses and glazes with a better understanding of the different ways in which they were produced. In doing so, it will be taken as a starting point the explanations of the processes of preparing lead-tin calx, anima, and alkali frit. It will, then, be discussed how these products can be detected by means of scientific analyses of glasses and glazes, with support for these hypotheses being provided by evidence from primary texts and observations at traditional workshops. Calx is the fine powder that is left after a metal or a mixture of metals has been calcined (oxidised) by heating in air to temperatures above the melting point. Producing lead-tin calx involves heating a mixture of lead and tin to their melting point and beyond to temperatures above 600 °C, while occasionally stirring the mixture. The resulting calx powder varies in colour from whitish yellow, when lead content is negligible, to deep yellow, when it contains lead in considerable amounts. The calcination reaction, as outlined below, is controlled by the composition of the mixture. If the Pb/Sn ratio is less than the stoichiometric requirement of 3.5 for the formation of Pb2SnO4 in the reaction (c), only the calcining reactions (a) and (b) occur and the resulting calx would contain a mixture of PbO and SnO2, in addition to some unreacted SnO, Pb, and Sn. This type of lead-tin calx was used as a white colourant and opacifier in archaeological glass and glazes (Matin et al. 2018). 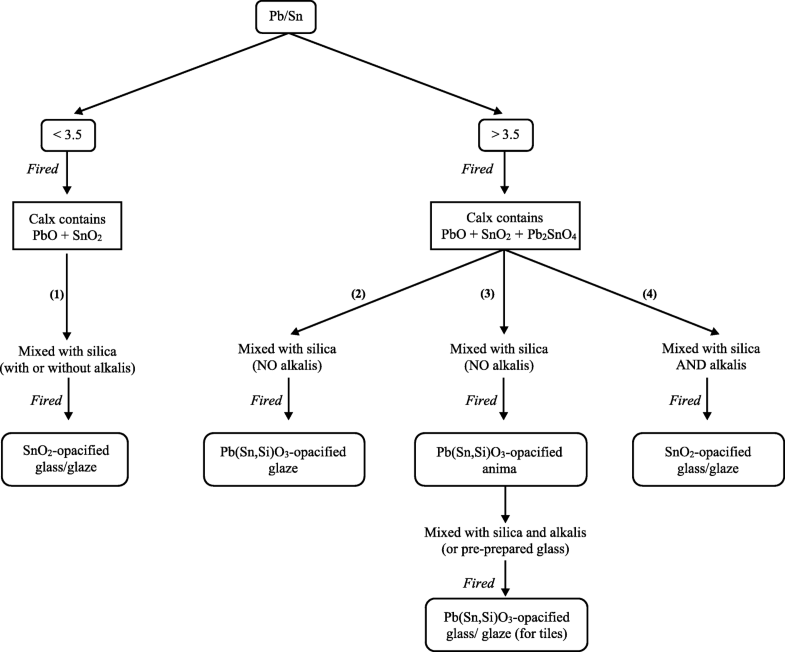 The calx could have been mixed with either only silica, a mixture of silica and alkalis, or a pre-prepared glassy frit, and subsequently fired to produce a glass or glaze opacified by SnO2 particles (Fig. 1, path 1). If Pb/Sn ratio is sufficient or more than the stoichiometric requirement of 3.5, the reactions (a), (b), and (c) are completed and the resulting calx powder would contain a combination of PbO, SnO2, and Pb2SnO4, in addition to some unreacted SnO, Pb, and Sn (Fig. 1). Previous XRD analysis of replicated lead-tin calces with Pb/Sn ratios of 7 and 30 fired to 600 °C and 800 °C confirmed that the calx mixture contained lead-tin-oxide type I (Pb2SnO4), cassiterite (SnO2), massicot (PbO, orthotombic structure), and litharge (PbO, tetragonal structure) (Matin et al. 2018). The subsequent treatment of the calx depended upon the concentrations of alkalis in the final glass or glaze product. On this basis, the calx which contained Pb2SnO4 would have been subsequently treated in two different ways, namely lead-tin anima and lead-tin alkali frit (Fig. 1, paths 2–4). In the absence or negligible amounts of alkalis (less than about 2 wt%), the calx was mixed with silica (SiO2) and heated to above approximately 800 °C to directly produce lead-tin-oxide yellow colourant and opacifier (Fig. 1, path 2). The resulting vitreous pigment is usually referred to as “anima” (plural anime), a term taken from Moretti and Hreglich (1984). During firing, variable amounts of SiO2 substituted for SnO2 in PbSn2O4 (type I) which caused a crystalline conversion to Pb(Sn,Si)O3 (type II) structures (Rooksby 1964; Kühn 1968; Clark et al. 1995; Matin et al. 2018). On this basis, anima is typically identified in archaeological glass and ceramic glazes by two different analytical methods. First, XRD or micro-XRD can be used to identify Pb(Sn,Si)O3 crystals, rather than the PbSn2O4 crystals present in the calx; and second, SEM-EDS or EPMA-WDS spot analysis can be used to show that the Pb/Sn atomic ratios is 1:1, as associated with Pb(Sn,Si)O3 crystals, rather than 1:2, as associated with the PbSn2O4 crystals of the calx. Lead-tin anime in compositions with negligible alkali contents were mainly used to produce yellow ceramic glazes. In the presence of alkali salts, a different set of reactions occur. Previous experiments demonstrated that during firing of a mixture of a calx, which contained Pb2SnO4 with silica and alkalis, Pb(Sn,Si)O3 crystals decomposed and secondary SnO2 crystals precipitated from the melt, and as a result, the colour of the glass or glaze changed from yellow to white (Matin et al. 2018). Without the addition of alkalis, the dissolution of Pb(Sn,Si)O3 and the consequent precipitation of SnO2 would still occur but only at higher temperatures (Molera et al. 1999; Tite et al. 2008). In order to prevent this dissolution to happen in alkali-rich compositions, the PbSn2O4-containig calx was first mixed and heated with silica. The anima was then mixed with either pre-prepared alkali glass or alternatively with silica and alkalis and subsequently fired to produce yellow glasses or glazes on tiles (Fig. 1, path 3). Direct mixing of Pb2SnO4-containing calx (Pb/Sn > 3.5) with silica and alkalis and firing the mixture to temperatures above approximately 750 °C—depending upon the exact composition of the mixture—resulted in the dissolution of the lead-tin-oxide and consequent precipitation of tin oxide particles and as a result, a white opaque alkali frit would form (Fig. 1, path 4). The main application of this method was in opaque white pottery glazes as early as the eighth century AD in Egypt and the Levant (Matin et al. 2018), which continued as a primary glazing method in the Middle East, Central Asia, and Europe until the nineteenth century (see e.g. Isfahani 1888). For opaque white glasses, calces with Pb/Sn less than 3.5 were mainly incorporated (Fig. 1, path 1) and the lead-tin alkali frit method seems not to have been commonly used except in few instances. It is likely that these samples might not in fact be related to a deliberate application of alkali frit but rather to the anime used in the glasses, which had accidentally reacted with the alkalis during firing and resulted in a glass opacified by tin oxide, rather than lead-tin-oxide. 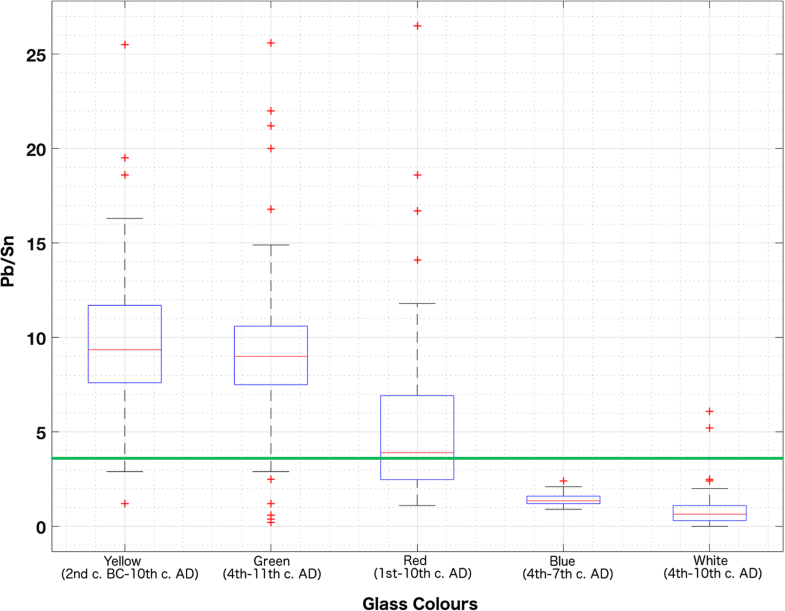 Published data on the chemical composition of 82 yellow, 80 green, 45 red, 14 blue, and 32 white opaque glass samples spanning the period of second century BC to eleventh century AD is compiled in supplementary file Table S1. Figure 2 is a box and whisker plot of these data showing the distribution of Pb/Sn values for each glass colour. Each box indicates lower quartile (25th percentile), median, and upper quartile (75th percentile). The whiskers represent data within 1.5 times the inter-quartile range. Outlier points lying beyond the whiskers are shown as individual points. Since the dataset is not normally distributed, it is more significant to use median than average to designate the central tendency of Pb/Sn ratios. Pb/Sn median values of 1.3 and 0.6 for opaque blue and white glasses, respectively, (Fig. 2) indicate that they must have been opacified using calces with Pb/Sn less than 3.5, mainly containing PbO and SnO2 (see, Fig. 1, path 1). This assumption is confirmed by the fact that SnO2 crystals were identified by SEM-EDS or Raman spectroscopy measurements in blue glasses from Shikmona (Freestone et al. 1990), in white glasses from San Giovanni alle Fonti, Milan (Neri et al. 2013), and in blue and white glasses from Cyprus (Bonnerot et al. 2016). The amount of Na2O + K2O is typically between 13.6 and 22.1 wt% for blue glasses and between 14.5 and 22.4 wt% for white glasses. Two exceptions were a white glass from Cyprus, dated to fifth to seventh century AD with Pb/Sn of 5.2 and Na2O + K2O of 6.3 wt% (Bonnerot et al. 2016), and a bluish white glass dated to sixth to ninth century AD with Pb/Sn of 6.1 and Na2O + K2O of 13.4 wt% (Henderson 1999). The production of these two glasses might be associated with deliberate use of an alkali frit or with the use of an anima that had accidentally reacted with alkalis during firing. In either case, lead-tin-oxide crystals from the initial calx had dissolved in the glasses and tin oxide particles had precipitated as secondary crystals (see, Fig. 1, path 4). For opaque yellow and green glasses, the median for the Pb/Sn values is 9.1 and 9.0, respectively, indicating that, unlike the blue and white glasses, they must have been opacified using calces with Pb/Sn greater than 3.5 which mainly contained PbO, SnO2 and Pb2SnO4 (see, Fig. 1). The significant concentrations of alkalis in yellow (2.2–20.6-wt% Na2O + K2O) and green glasses (7.5–29.8-wt% Na2O + K2O) suggest that the calx powder must have been initially fritted with silica to produce anime with Pb(Sn,Si)O3 crystals. The anime were subsequently mixed with pre-prepared alkali glass to produce yellow and green glasses (Fig. 2, path 3). The duration of heating would have been kept to a minimum to avoid dissolution of lead-tin-oxide crystals and hence the anime-based yellow glasses typically have relatively heterogenous microstructures. Characteristic features of this process as seen in SEM images are stratified glass microstructures with stripes containing Pb(Sn,Si)O3 particles due to the addition of the anime. Examples are green glass tesserae from Kilise Tepe (Neri et al. 2017, Fig. 10e; sample KT NS 001, Pb/Sn = 7.7) and Shikmona (Freestone et al. 1990, Fig. 3; sample 29353Q, Pb/Sn = 10.5)). 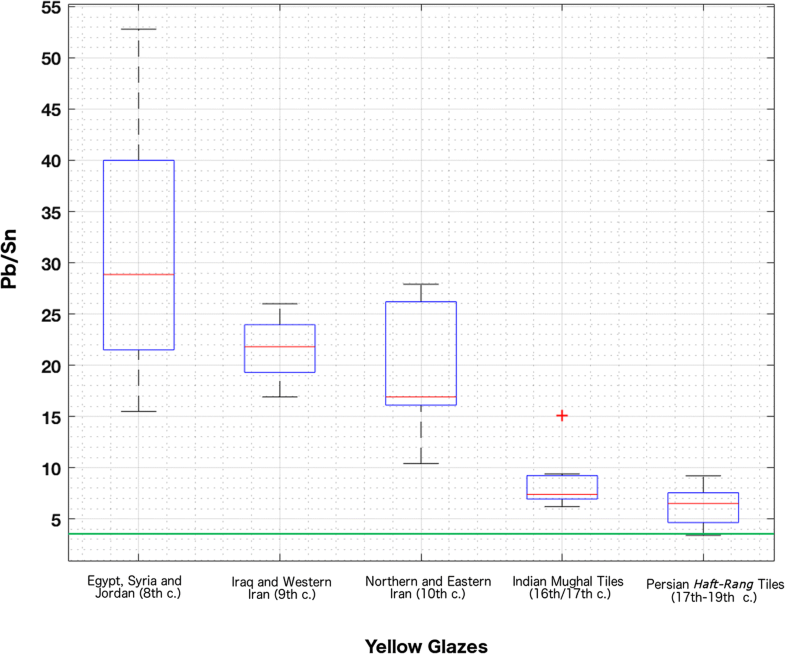 Alternatively, the microstructure of the glass might show bigger aggregates of lead-tin-oxide crystals within the glass matrix, such as in opaque yellow glass from Tarbat Ness, Scotland (Peake and Freestone 2014—Fig. 3.1–3.2, sample 25/1458, Pb/Sn = 8.4). In other cases, Pb(Sn,Si)O3 crystals have been found more evenly dispersed in the glass. Such crystals were identified in yellow and green glasses from Hagios Polyeuktos (Schibille and McKenzie 2014), Shikmona (Freestone et al. 1990), Kilise Tepe (Neri et al. 2017), San Giovanni alle Fonti (Neri et al. 2013), Schleitheim (Heck et al. 2003), Cyrpus (Bonnerot et al. 2016), Khirbet al-Mafjar (Fiorentino et al. 2017), and Amorium (Wypyski 2005) by means of SEM-EDS, EPMA-WDS, Raman spectroscopy/microscopy or LA-ICP-MS.
A group of anise-green coloured tesserae from San Giovanni alle Fonti (Neri et al. 2013; samples Ve1–3, 5) with Pb/Sn in the range 0.4–1.2 were revealed to have been opacified by SnO2 and hence fall into the white and blue glass category discussed above (Fig. 1, path 1). One sample of anise green tesserae (Ve4) was found to contain significantly higher Pb/Sn value of 6.5 and opacified by SnO2. It is likely that this sample was initially opacified using the Pb(Sn,Si)O3 anime method (Fig. 1, path 3) but was accidentally fired for too long. During firing, Pb(Sn,Si)O3 crystals would have reacted with alkalis and dissolved in the glass and SnO2 particles subsequently precipitated (Fig. 1, path 4). Compositional data for opaque red glasses indicates that calces with a diverse range of Pb/Sn ratio values between 1.1 and 26.5 and with a median of 3.9 were used for opacification. This suggests that both methods of opacification by SnO2 particles using calces with Pb/Sn values less than 3.5 (Fig. 1, path 1) and by Pb(Sn,Si)O3 particles in anima using calces with Pb/Sn values greater than 3.5 were used in red glasses. For samples of red glass from Amorium which were found to have been opacified by SnO2 particles (Wypyski 2005; samples 35–41), the Pb/Sn value for only one sample (no. 38) is less than 3.5 and the rest fall into the category of Pb/Sn greater than 3.5. It is likely that, similar to the anise green sample Ve4 discussed above, the opacification process for the Amorium red glasses with Pb/Sn values greater than 3.5 was a result of accidental reaction of Pb(Sn,Si)O3 with alkalis and thus subsequent formation of secondary SnO2 crystals. Some discrepancies are also observed in the published data for red glasses. For instance, microstructural analysis of samples of red glass from Kilise Tepe indicated that they were opacified by Pb(Sn,Si)O3 crystals dispersed in striped structures and with Na2O + K2O ranging between 12.4 and 21 wt% (Neri et al. 2017; samples KT NS 003, 007, 019). This observation would immediately recall the lead-tin anime method of opacification as presented in Fig. 1, path 3. However, the Pb/Sn ratio values were reported to range between 1.7 and 2.2, which is notably less than the minimum amount of 3.5 required for the Pb2SnO4 crystals to form in the calx. This might be due to analytical error in the determination of lead and tin in these samples. It would be useful to repeat the analysis for these samples. A number of crucible fragments associated with the manufacture of lead-tin-oxide yellow glasses were found in a first- to third-century AD context in England (Catsgore, Somerset: Biek and Kay 1982) and in fifth- to seventh-century AD contexts in the Netherlands (Maastricht: Sablerrolles et al. 1997; Wijnaldum: Henderson 1999; Sablerrolles 1999; Rijnsburg: Bloemers et al. 1986), Switzerland (Schleitheim: Heck et al. 2003), and Ireland (Dunmisk Fort: Henderson 1988). Analyses of the glass attached to the crucible walls revealed a dispersion of lead-tin-oxide particles in a primarily silica glass (Biek and Kay 1982; Henderson 1988, 1999; Heck et al. 2003) and in the case of the Irish crucible glass, with some areas of pure silica (Henderson 1988). This evidence suggests that the crucibles were used in the process of firing a mixture of lead-tin-oxide calx powder and silica to produce lead-tin anime frit. The anime charge of the crucible was subsequently mixed and fired with a soda-lime glass to produce opaque yellow glass. Table 1 shows the EDS chemical composition of crucible glass from Schleitheim (Heck et al. 2003) and Wijnaldum (Henderson 1999). For the Schleitheim samples, the Pb/Sn value in the anime adhered to the crucible is directly comparable to that of glass bead, but the latter contains higher amounts of SiO2, Na2O, and CaO indicating that glass with a soda-lime composition was added to the anime. Glass beads from Wijnaldum contain variable amounts of Pb/Sn, which are greater or less than that of the crucible glass. This suggests that either calces with a variety of Pb/Sn ratios were used at the workshop or that some of the glass beads were imported to the site. As in the case of the Schleitheim samples, the amounts of SiO2, Na2O, and CaO in glass beads from Wijnaldum are consistently higher than those in the crucible glass, which suggests that glass with soda-lime composition was added to the crucible anime. Data on the chemical composition of 157 samples of white glazed ceramics spanning the period between the eighth and nineteenth centuries AD is compiled in Supplementary file Table S2, and the distribution of Pb/Sn values is presented in Fig. 3. The majority of white glazes fall into the category with Pb/Sn values greater than 3.5 and with the amount of alkalis varying between 1.8 and 13.3 wt%, corresponding to the procedure shown in Fig. 1, path 4. This group includes early Islamic ceramics from the Levant and Central Asia (Samarqand); medieval lustre wares from Iran, Egypt, and Spain; Iznik wares; and maiolica wares from Spain and Italy (Fig. 3). The remainder correspond to the category with Pb/Sn values less than 3.5 (Fig. 1, path 1) and include early Islamic white glazed wares from Iraq and western Iran (Abbasid Samarra-type blue-on-white and lustre wares), Persian Mina’i wares, haft-rang tiles, and the majority of Archaic Italian maiolica wares. For opaque white glazed pottery, the amount of alkalis is typically between 0.3 and 12.9 wt%, but for Persian haft-rang tiles, it is significantly higher between 6.5 and 21.4 wt%, which is directly comparable to those of white glass discussed above in “Archaeological glass data” (see also, Fig. 2). The distribution of Pb/Sn values for 37 samples of yellow glazed ceramics (Fig. 4) based on data presented in Table S2 demonstrates that they all fit within the group with Pb/Sn greater than 3.5. The yellow glazed wares contain significantly higher Pb/Sn values and less alkali contents (10.4–52.8 Pb/Sn (Fig. 1, path 2); 3.4–15.1-wt% Na2O + K2O) than the Indian and Persian yellow glazed tiles (3.4–15.1 Pb/Sn (Fig. 1, path 3); 2.7–20.8-wt% Na2O + K2O); that is, the yellow glazes on tiles are closer in composition to yellow glass discussed above in “Archaeological glass data” (see, Fig. 2). Calx, transliterated kals in Persian and Arabic, is described in some of the medieval and late technical texts on opaque glazed ceramic glazes in the Islamic lands and Europe. Some of the texts have only given it a passing mention as an ingredient that was mixed with ground quartz (i.e. silica) to produce opaque white glazes (see e.g. Mohammad Jowhari Nayshaburi, AD 1196; Afshar and Daryagasht 2004, 362). Others provided recipes and more detailed descriptions for calcination of lead with tin. One of the earliest texts that describe the calcination process of lead with tin is the Persian treatise by Abu’l Qasim Kashani (1301 AD). In the appendix to his treatise The virtues of jewels and the delicacies of perfumes (Arayis al-Jawahir va Nafayis al-Atayib), Kashani recorded recipes for lead-tin calx for opaque white glazes, with Pb/Sn equal to 9 or 3, or for better mixtures, 6. 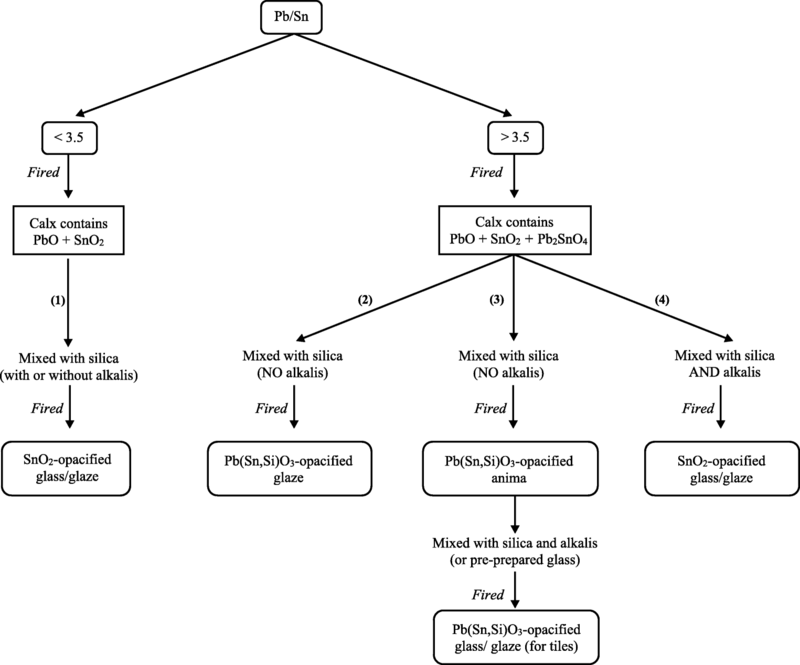 The calx with Pb/Sn equal to 3 would have been used directly in the glazing mixture (Fig. 1, path 1; “Pb/Sn less than 3.5”), and those with Pb/Sn between 6 and 9 would have been used by the lead-tin alkali frit method to produce opaque white glazes (Fig. 1, path 4). One takes 3 parts of good white lead (asrab) and a third of a part [or one part] of tin (rasās), or if one wants a better and finer mixture up to half (of a part) of tin. First they put the lead into the kiln for a time, and then they throw the tin in on top of it. They mix them at a high temperature until they are well melted. When (this mixture) brings up an earthy substance on its surface it is completely ready. They then make the fire smaller and seal the furnace door with mud. The earthy substance which collects on the melt is taken off with an iron shovel until in half a day it has all gradually changed to earth. The craftsmen call this asranj (Allan 1973, 113; Afshar 2006, 342–3). If one wants to use tin alone to get a glowing white colour, one uses two earthenware vessels. Tin is put into one and beaten with an iron pestle until it all becomes earthy and black in colour. It is cooled and sifted with a fine sieve on the end of a ladle, and put into a second vessel [which has been baked]; they leave it until the fire catches it and it rises nicely from its place. When it is cool it is a white earth and it is used for making turquoise preparations (Allan 1973, 113; Afshar 2006, 343). Let us come on now to calcination. Kindle a fire of dry wood and let it get so hot that the tin, when put into it, melts directly. Once melted, leave it in this state until such time as a skin is seen to form upon it, and then the skin to lift itself up somewhat and to crust over, and when the melted tin is quite covered over with those crusts, then and there it is pushed with that curved iron plate against the wall at the rear side. But ere I proceed further I would mix you the lead and the tin, for the tin never goes alone into the furnace. Do as follows, therefore, take: (A) Tin/Lead = 1 lb/4 lb; (B) Tin/Lead = 1 lb/6 lb; (C) Tin/Lead = 1 lb/7 lb. […] Having made one of these combinations, put it in the furnace and follow the manner that has been explained to calcine it, keeping the fire always at an even heat, for if you were to increase it the whole would return again to a melted state. […] This mixture of lead and tin is kept long enough in the fire for it to crust and for the crust to be constantly pressed with the iron on the wall, so that it all turns to ashes, and then when the ash becomes white or somewhat yellowish, it is collected into a copper cauldron which is quite clean and dry. To make the tin crust sooner, many are accustomed to throw some bits of sulphur into the furnace, which does not displease me! (Lightbrown and Caiger-Smith 1980, 59–60). Piccolpasso then provided different recipes for glazes of different colours (i.e. green, yellow, light yellow, greenish-blue, light blue). For the base opaque white glazes (Lightbrown and Caiger-Smith 1980, 61–92), a mixture of marzacotto (sintered mixture of sand, wine lees and common salt) with lead-tin calx, and sometimes further sand was painted over a biscuit fired body. Coperta (a transparent glaze) or other types of decoration were applied over the unfired glaze and all fired together for a second time. Melt in the kiln one maund of lead (surb) and one quarter maund of tin (gal). But I must explain how to do this. Take an earthen vessel, on its side make two holes opposite to each other, place it in the kiln, throw in the lead and tin, stop up the mouth of the vessel, and heat the kiln so that the flame enters from the back hole of the vessel and comes out from the front hole in such a way that the fire clasps the lead and tin from above and below. Thus you keep on heating till the lead and tin melt. After melting, you decrease the fire gradually till the melted lead give forth a froth (kurk), then you remove the lid of the vessel, and remove to one side the froth, again decrease the fire, froth is again formed which you remove as before until the whole of the lead and tin has turned into froth. You take it and bray it fine on a stone. Then take four parts of the previously mentioned refined paint [i.e. alkaline frit] and one part of this lead and tin (turned into froth and brayed), and mix them for a coating and varnish (la’ab). Keep this kind (Isfahani 1888, 4). Bray as before, three parts of lead and one of tin, add to them six parts of that glass-like paint [i.e. alkaline frit] before mentioned, put all in a vessel of water with a little clear gum Arabic. With this paint the brick uniformly, place it in the kiln—using only half the previous degree of heat for this the ‘seven-colours process’. On removing the brick from the kiln it will be found to be white—the effect of the above drug (Isfahani 1888, 9). If you want a yellow colour, take sixteen parts of lead and one of tin, melt them together, take the froth (kurk) and heat it; when it begins to melt, add a quarter of its quantity of well brayed stone [i.e. quartz], and mix thoroughly. Bricks or vases painted with this preparation and heated, will come out of the kiln a yellow colour-like a servant who has acted perfidiously, and who, as is well known, turns yellow. With an iron ladle (sikh), skimmer-like, you must take out the yellow colour when melting, bray it, mix it with solution of gum Arabic (la’ab-i-ktira), and apply it to bricks or vases. This requires only half the heat of other colours (Isfahani 1888, 9). They put three manns [roughly 9 kg] of lead in a pan (which is known as tavā in their local dialect) and put it in the furnace. Lead melts slowly and after it is entirely melted down, they add less than one mann [roughly 3 kg] of tin, so that after melting, it is mixed with lead. On this burning mixture, something like ash emerges, which they take to a side using a stick. This gradually develops into a zarnikh [Persian name for realgar and orpiment] yellow colour. They carry on this until the whole mixture turns into the yellow powder. When mixture is very hot, they drop some tin in it to see if it sparks or not. If it does so, they say the lead is fired and they slowly pour it in a container with two wooden handles, which they call chighāvān, to cool down (Sedigh and Karimi 1965, 5). In April 2015, the author visited Lalejin in order to study the lead-tin calcination processes that were being undertaken at several workshops there. The workshop of Mr. Seyyed Mehdi Hosseini conducted the oxidation of lead with tin for the addition to opaque glazes produced in the same workshop. The firing was carried out in an open-air furnace located at the back of the workshop. The furnace was an updraft type, equipped with a central chimney at its roof. It comprised of a dome-shaped chamber, made of clay bricks which were covered by a fireclay paste and had an open front (Fig. 5). A stainless-steel pan was placed at the bottom of the dome. 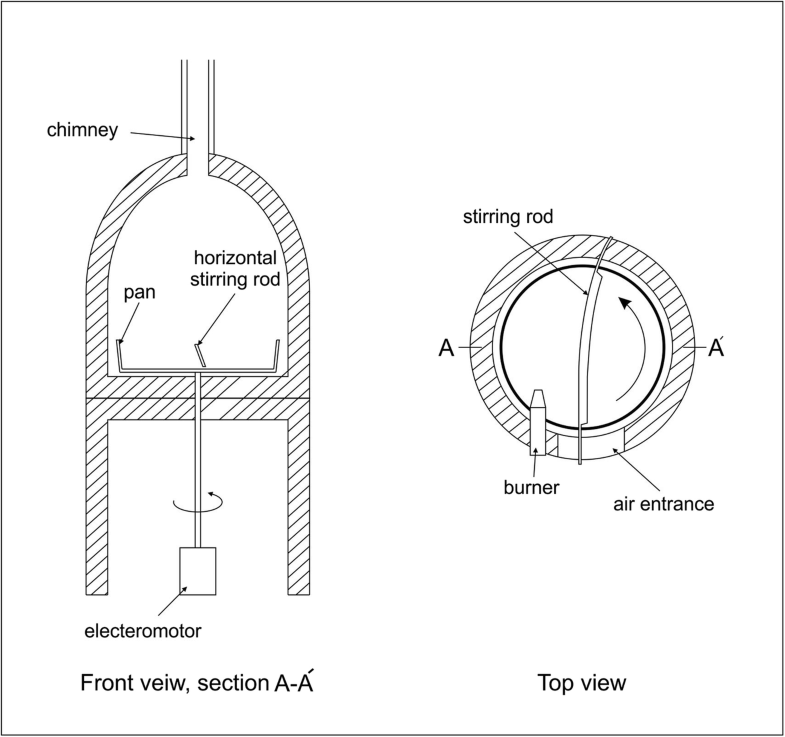 The pan was connected to an electric motor beneath the chamber and turned at a constant speed. A steel rod, approximately as long as the diameter of the pan, was set at a fixed position parallel and just above the bottom of the chamber and functioned as a constant stirrer for the mixture. A gas burner was established at the open front of the chamber. The fire was burnt red hot. The choice of the tin/lead ratio is a matter of finance. Higher tin:lead ratios result in enhanced opacity and general quality of the glaze. However, the potters tended to decrease the amount of tin used over the years for financial considerations. After heating the mixture for approximately 15 min, it started to melt and in about a further 5 min a grey earthy powder was produced (Fig. 6a). XRD analysis indicated that the powder primarily contained lead (Pb), tin (Sn), litharge (PbO, tetragonal structure), massicot (PbO, orthotombic structure), and romarchite (SnO), the latter being responsible for the grey colour of the powder. With another 10 min, the mixture began to get a tint of yellow, but with the dominant colour being dark grey. The formation of yellow powder increased with time and after a further 40 min, an entirely yellow powder was produced. This was left to cool down and was then collected for glaze production (Fig. 6b). XRD analysis of the calx powder showed mainly lead-tin-oxide in the form Pb2SnO4 (type I) and cassiterite (SnO2), as well as massicot and litharge (PbO). Insights into the processes of tin-based opacification suggest that the calx was the main ingredient in manufacturing opaque yellow and white glass and glazes. The similarities in the compositions and the Pb/Sn values, first, between opaque yellow glasses and glazes from eighth century Egypt and the Levant, and second, between opaque white glasses and glazes from ninth century Mesopotamia suggests that tin-based opacification of ceramic glazes is likely to have began in relationship to the development of tin-opacified glass in these regions. For each category of opaque glass or glazed ceramics, Pb/Sn values can be a useful proxy for monitoring variations in the methods of opacification. Taking Rice’s (2015, 202) description of standardised production as one in which “little heterogeneity in composition and appearance (form and style) is evident within each category,” one is entitled to argue that less variations in the ranges of Pb/Sn of calces may suggest a more standardised production for opaque glass and glazes. For instance, the Pb/Sn values for Persian Mina’i and lustre wares, considered to have been produced in Kashan, fall within a very tight range between 2.5 and 3.3 with the median of 3 for Mina’i wares, and between 5.4 and 7.6 with the median of 7.2 for lustre wares. This is in agreement with Abu’l Qasim Kashani’s recipe for calx with Pb/Sn of 3, 6, and 9 for opaque white glazes. Similarly, the Pb/Sn values for Italian maiolica wares and Persian haft-rang tiles fit within a relatively tight range and are in agreement with recipes given by Piccolpasso for maiolica wares with Pb/Sn values of 4, 6, and 7 and by Isfahani for haft-rang tiles with Pb/Sn value of 3. For opaque yellow glazes of haft-rang tiles, the Pb/Sn values range between 3.4 and 15.1 with the median of 7, but they are far from the Pb/Sn value of 16 that is suggested in the recipe by Isfahani. The widest ranges of variations in Pb/Sn values for opaque white glazes are seen in Egyptian lustre and Iznik wares; for opaque yellow glazes, in Egyptian and Levantine wares; and for glasses, in red, green, and yellow glasses. In general, the extent of variations of Pb/Sn values in opaque yellow glass and glazes is more than that in opaque white glass and glazes. This is partly due to the fact that, in opaque yellow glasses and glazes, the Pb/Sn values in the calx must be above 3.5 as dictated by the stoichiometric ratios, but there is no maximum limit for the Pb/Sn ratio from which yellow opacity results. Therefore, PbO concentrations as high as nearly 70 wt% were used in yellow glasses and glazes. In the yellow pottery glazes, lead oxide also acted as the main fluxing agent since the amounts of alkalis in the composition of these glazes is negligible. This paper will hopefully encourage further studies of the composition and production procedures of lead-tin calces by examining different types of opaque glass and ceramic glazes. I am grateful to Professor Michael Tite and two anonymous referees for their valuable comments on an earlier draft of this paper.